Terraplus KT-10 used to measure magnetic susceptibility. Magnetic Susceptibility of iron is often much higher than most other materials. Geonics EM-38 measures apparent conductivity of soils and magnetic-susceptibility. that reflects the intensity of magnetization in a material from an external homogeneous field. Wow. In simpler terms, it is the ratio of what you get back to what you put in. This fraction is the proportionality constant k, which is the magnetic susceptibility. It can be a complex function when other outside factors are applied. For example, one could measure a negative magnetic susceptibility for some materials when the primary field has a certain frequency. Further discussion of this is outside the scope of this page. Nonetheless, there is no doubt that studying the magnetic susceptibility of materials is far more complicated then this. However, acquiring magnetic susceptibility measurements is fairly straight forward and much easier to measure than many other rock properties. Please note that K.D. Jones Instruments has a wide assortment of geophysical equipment to rent, in addition to magnetic susceptibility meters. 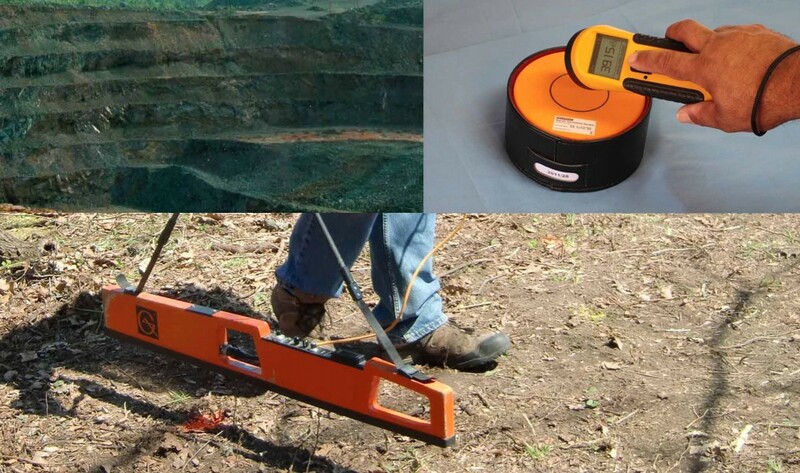 is often used to measure the magnetic susceptibility of rocks or soil.The magnetic susceptibility of rocks and soil is more or less controlled by the mineral content of the material. It is the minerals within a rock that contain the diamagnetic, paramagnetic, and ferromagnetic materials. Because of this relationship geophysical and geologic studies are conducted to assist with mapping variations in magnetic susceptibility. Often these variations are correlated to other geologic conditions for mineral exploration, geologic mapping, archaeological investigations, environmental issues, and ground truthing other types of studies. Even when magnetic susceptibility measurements are acquired using the manufactures recommendations, there are times when magnetic susceptibility studies do not yield desirable results. When this occurs one needs to determine if other geophysical methods can assist with investigating the problem at hand. Here you can find a geophysicist to consult with or click here to explore other engineering geophysical applications. by answering 3 easy questions. Or, you can go to the bottom of the page and leave a comment. Are you interested in renting a magnetic susceptibility meter? Do you know what type of meter you need? For someone to respond to this form, we will need you to enter some way to contact you on the next page. If you do not want anyone to contact you, just leave it blank. This is optional. Select how you wish to be contacted. Rent a Magnetic Susceptibility Meter for Rock and Soil Testing © 2019. All Rights Reserved.